After a hard day of teaching, I often plop down on my desk chair at home and gaze up at a framed drawing hanging on the wall above my desk that a dear friend of mine gave me. It is a detailed depiction of a pair of wood ducks serenely floating on a calm pond. One of the ducks is male that has brightly colored feathers and beak; the other is female that is plain gray and nondescript. Yet both are at peace and comfortable with each other. Some students come to class with their own emotional baggage and seem to not really care about the teacher. To them, the teacher is just another figure of authority. When they act out, it helps me to realize that even though I have taught the students to behave otherwise, and the students are purposely misbehaving, I need to remember that the students are lashing out at the authority figure. It is difficult though to separate the role of "teacher" from myself as an individual when a student responds rudely to polite requests. I have found that if I am successful, internal calm is easier to maintain. The best way to do this is to frame all the tasks and their expected behaviors before setting the students to work. If you have correctly framed what you expect the students to do, and you find students not doing it, you are in a position to ask the students what way you can help the be successful in doing what they are supposed to be doing. If this doesn't work then at the very least you can ask them why they are not doing the task and re-explain any consequences. I discovered early in my career that when I am completely prepared for class, calm is easier to maintain. Because I am prepared, I can stand at the door and greet students as they come in. I am able to see how students respond and can get a leg up on how to help them be successful that day. Students enter the class with my cheerful greeting and my positive comments and are prone to behave just a little better. Ever wonder why businesses can afford to pay a person to stand at the door just to greet people as they walk in? Banks know that a greeter is a security measure by reducing the anonymity of the individual. Stores see reduced shoplifting and increased levels of purchasing because someone paused long enough to say hello to customers as they entered. Most of the time, if a student has been unruly or non-participatory in a class, a simple phone call to a parent or guardian can make a world of difference in their behavior the next day. When I speak to the parents of the student's misbehavior, I try to show concern for the student rather than frustration about the behavior. This usually helps the parents to not be defensive and be more willing to address the issue at home. I advise that this phone call happen prior to a student getting home so the adult can hear from me first. Perhaps the most important thing I do that helps me to maintain that calm assurance that I need to be an effective educator is reflecting on the day. I ride the city bus home and that is when I do my reflections. During the hour commute I think about the successes, and I think about which interactions with students need more work. I think also about my blunders and how I might repair the damage those times I may have not remained calm. Interestingly enough, students are usually willing to start fresh the next day, so I need to do the same thing (holding grudges against particular students I have found destroys my internal peace). After reflecting, then I am able to create effective plans to make things go better the next day. 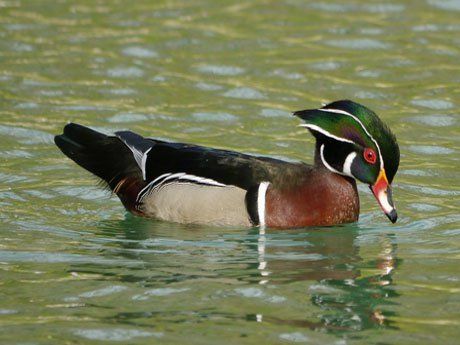 Wood ducks have a hard life: eating bugs, swimming in the cold water, dealing with bad weather, avoiding predators (human and otherwise), and yet they are able to maintain a calm, confident serenity. Reflecting on my own behavior and making plans to improve provides me with a measure of confidence that it is going to be better tomorrow -- and that allows me to relax a bit more and enjoy my family and friends more fully. Peace. What have you found that helps you to find Wood Duck serenity? Please share in the comments section below.